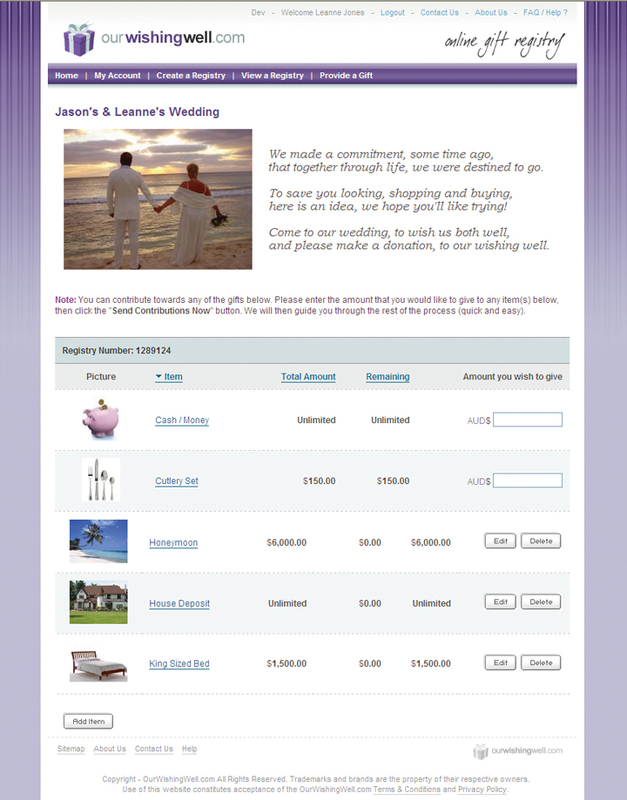 BabyWishingWell.com is an online gift registry & wishing well that allows people to contribute money towards any gifts for any event using an innovative virtual gift system. It provides a modern way to save time and money for events. It helps people (hosts) to request contributions toward gifts in a professional, elegant, quick, easy, and secure way (24/7 from anywhere around the world). It helps people (guests) to contribute towards gifts in a professional, elegant, quick, easy, and secure way (24/7 from anywhere around the world). With our system, you add any items you like - from any shop or any store. You can even add items like "honeymoon" items and a "house deposit", and then people can put money towards these items (to help make the wishes come true). Another useful consideration - more people are living out of home before they get married and are often helping to pay for the wedding/honeymoon themselves ... what they really need is money to help pay for the things they need and want. Our system provides a professional and elegant way to allow guest to help contribute towards the things that the host really needs or wants. See more of the product benefits.